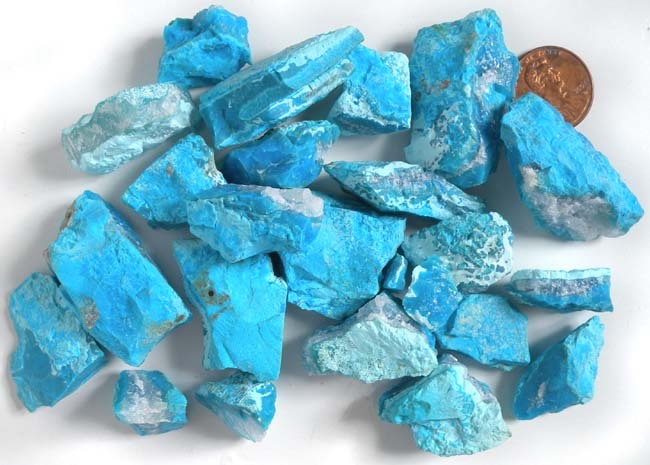 Gem Silica is the rarest and most desirable form of Chrysocolla. This material cuts and polishes easily, but coarse wheels may cause fracturing. 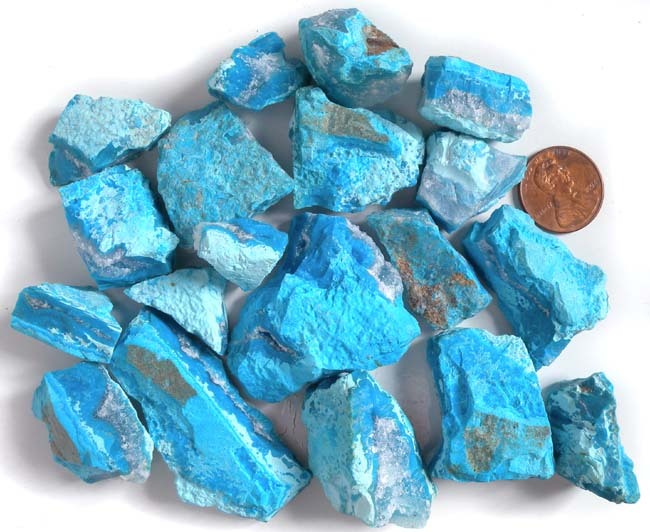 This Gem Silica has fabulous color and will produce valuable gems. Gem Silica takes a great polish with tin oxide or diamond, and may be followed up with green rouge (Zam is a brand name for green rouge). Mohs hardness 5.0 to 6.0. This Gem Silica may be referred to as #2, but it will cut really great stones. The yield won't be as good as the other rough we have and the resulting stones may be a little smaller, but you can't beat the price! Some pieces may have a little pocket of drusy. Triangular shape measures approximately 31.8 x 18.1 x 9.1mm thick. Two piece parcel of triangular shapes measures approximately 27.3 x 16.0 x 8.0 to 3.9mm thick, and 23.7 x 12.0 x 9.2mm thick. Two piece parcel of triangular shapes measures approximately 29.8 x 12.5 x 10.2 to 3.7mm thick, and 24.5 x 13.8 x 6.3 to 4.5mm thick. Triangular shape measures approximately 35.5 x 25.4 x 8.5mm thick. Three piece parcel of triangular shapes measures approximately 23.9 x 14.8 x 7.2mm thick, 23.0 x 17.2 x 8.0mm at the thickest point, and 26.0 x 9.4 x 5.9 x 7.6 to 5.3mm thick. Triangular shape measures approximately 30.3 x 27.5 x 9.5mm thick. Three piece parcel measures approximately 15mm x 13.8 x 9.2mm thick and two triangular pieces at 27.1 x 14.0 x 13.3 at a peak and 21.3 x 16.3 x 5.7 to 4.5mm thick. This Gem Silica is #1 Grade, which means it will generally cut larger stones and produce a higher yield. It may not be quite as good of a value as the #2 Grade, but may work out better for amateur cutters. Some pieces may have a little pocket of drusy. Measures approximately 22.6 x 23.0 to 11.8mm x 11.0mm thick. Two piece parcel measures approximately 25.6 x 12.3 x 6.8mm thick, and 23.9 x 11.4 x 7.6mm at the thickest place. Measures approximately 16.9 x 7.9 x 4.8mm thick at a ridge. This Gem Silica has drusy quartz! It is the most sought after form of Gem Silica. 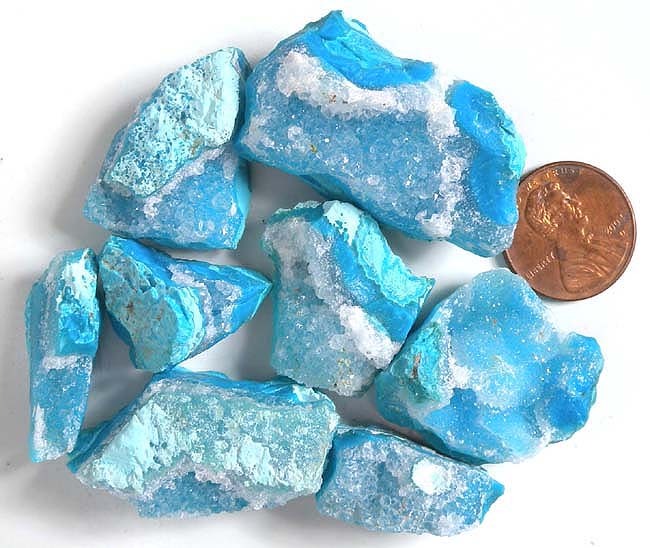 This Gem Silica will cut gorgeous blue stones with sparkling drusy! Measures approximately 27.1 x 18.6 x 16.1 to 8.1mm thick. Blue/Green Drusy on Malachite.